Join Us!!! We are looking for someone to help us cover Tahitian basketball. Please send us an e-mail. The Cook Islands celebrate Women's Polynesian Cup 2018 title. Keziah-Brittany Lewis (178-G-95, college: Kent St.) top-scored for the winners with 22 points. Terai Sadler (178-F-92, college: Cent.Arkansas) collected 13 rebounds for the winning side. The Cook Islands, Tahiti, and host Samoa will represent the Polynesia region in the 2019 Pacific Games. Tahiti beat Samoa to reach the Final of the Women's Polynesian Cup. 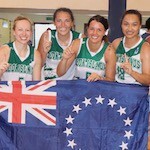 They also advanced to the Pacific Games with the 91-75 win. Oceania LeFranc stepped up with 25 points and 19 rebounds, while Pitoura Lucie Matohil and Aeata Oceana Hana Tepu chipped in 16 points apiece. Cherish Manumaleuga (00) replied with 34 points in the losing effort. Frances Teneva Ropati scored 14 and Fialauia Faifeau Hunt brought 12.